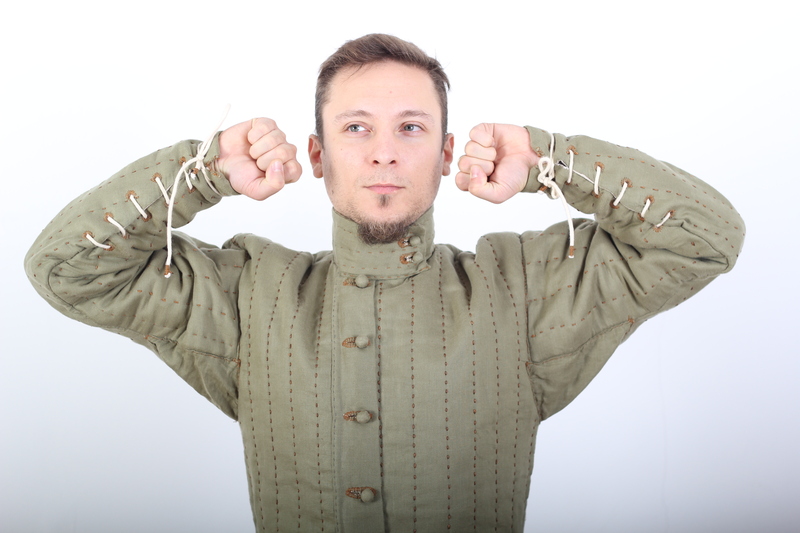 We are proud to present to you – the best gambeson we’ve made so far! This is a completely handsewn gambeson, based on late medieval depictions and written sources. It’s composed of six layers of thick coarse linen fabric, lined with soft linen on the inside, and fine green linen on the outside. The project took a long time to complete, but we are proud to say that every stitch on that medieval gambeson is sewn by hand. The garment is meant to be worn underneath a maille armor, covered with a second – padded gambeson on top. It’s very flexible and comfortable while at the same time providing adequate protection for the arms, legs and torso of the wearer. The sleeves have a long slit with several sets of holes that allow variations in fastening. The collar buttons up on the side, so it can be taken down in warmer weather. Overall, this medieval gambeson is the golden standard of what you need to wear under any type of armor if you’re reconstructing European soldiers from the 13-14th centuries. This entry was posted in Clothing and Garments and tagged gambeson, Handsewn Gambeson, medieval gambeson.